As the interactive entertainment industry continues to grow, game development becomes more and more accessible. One of the pleasing effects of this, at least for me, is watching the number of games from nations other than the “usual suspects” increase dramatically. China is one of those nations that’s been traditionally underrepresented, but has come out swinging in recent years with indie projects like Koi and Candleman. Oasis Games, a Chinese developer and partner of Sony Computer Entertainment Shanghai, has been responsible for developing and/or publishing many of these titles—including the aforementioned fish-centric game—and their latest, Hidden Dragon Legend, continues the trend of bringing us Chinese developers’ imaginative contributions to the medium. It pains me a bit to note that the first point of comparison I thought of for Hidden Dragon Legend was old kung-fu movies, but I’m fairly certain at least part of that was intentional. Oasis’ protagonist of choice is an amnesiac young man with special powers (that somewhat torture him, because of course they do; “What am I?” he probably asks himself at one point or another) going up against a shadowy organization who has a nasty habit of killing off the dull peripheral characters he meets before we even get a chance to know one line of their backstories. This might seem like a bad thing, but I was all too eager to dive into this big ol’ bag of clichés, hokey English voice acting and all. Whether intentional or not, the goofy presentation of the story is a lot of fun. One early scene, in which the protagonist cries out the name of two people he just met after they’re killed, had me doubled over in laughter. There’s something about the earnestness of it all that’s really charming, even if it’s not effective drama-wise. 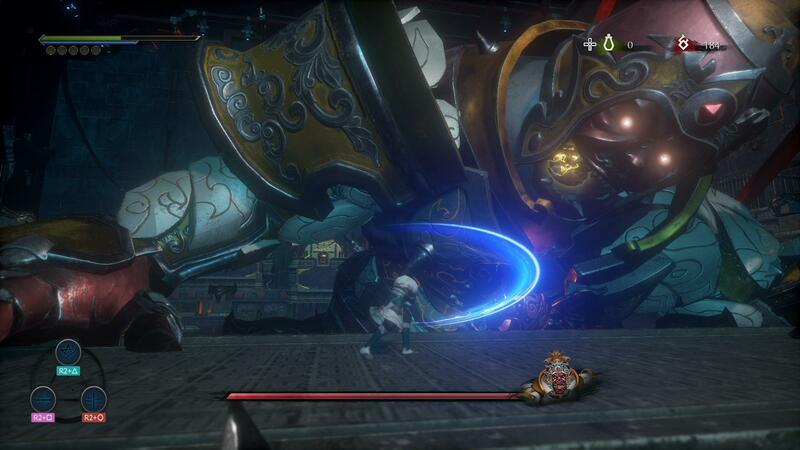 Outside of the story, the game is a fairly traditional 2.5D beat-em-up with light platforming elements. Yes, the game is billed as an “action platformer,” but I think it fits the predictable rhythms of a game like Streets of Rage or Double Dragon a lot more. Walk a few steps, hop a few times, and then get held up by a group of enemies that require a combination of button-mashing and careful dodging. There is some platforming on the way, but it’s not particularly unique or well done; in fact, the way the player character controls is sort of unfortunate given that Oasis considers the game a platformer. There’s something that just doesn’t feel quite right about the way he jumps and lands, which made me glad to find out the focus was on the combat. The issue is, sadly, that the combat isn’t much better when it comes to polish. There’s been a lot more detail put into this aspect, certainly, than any other element of the game—there are a number of different combos to execute, there’s the special “rage” meter that allows the protagonist to execute special moves, and there’s a fairly sizeable skill tree that introduces some RPG elements into the mix. Still, even with all that said, combat rarely evolves past hacking and slashing enemies and the occasional dodge when an enemy telegraphs their attack; only the boss battles provide challenges that require a little more strategy, but they’re nothing special compared to the likes of other old-school games where memorizing patterns and lightning-fast reactions were critical to staying alive. The combat also suffers from some of the same clunkiness as the platforming. These certainly aren’t the worst mechanics I’ve ever played with—not even close, when I’ve got gems like Afro Samurai 2 under my belt—but there’s this slightly off, awkward feeling about the animation and timing that leaves combat feeling unsatisfying. My current standard for polished 2D combat is Odin Sphere Leifthrasir, and frankly, Hidden Dragon Legend comes nowhere near that. When it comes to aesthetics, I was impressed by a lot of the spectacle Oasis put into some of the more memorable scenes and set pieces. One boss battle set against a hulking, towering armored enemy is particularly incredible to behold. Unfortunately, outside of these moments, I can’t say I was terribly impressed with the presentation here. That has little to do with the technical aspects—a fine job’s been done on the modeling and texturing, particularly for an indie game—and more to do with the overall artistic design, which didn’t leave much of an impression on me. Just look at any few given screenshots and you’ll see what the problem is; the game is dark, really dark, which leaves a lot of little details in the shadows and muddies the color. It wasn’t all that pleasant on the eyes for me. The soundtrack is a little more interesting, with a lot of use of traditional instruments, but I felt like the tempo and tone were sometimes at odds with the violence on the screen. There’s a fair amount of dramatic music for the most thrilling moments, to be sure, but there’s a lot of atmospheric stuff that doesn’t play well with the focus on combat. This is thrown into especially sharp relief given how the default mixing prioritizes the sound heavily above the music, creating an odd effect where the serenity is drowned out by the sounds of people being stabbed, slashed and impaled. The music itself is quite good, and I’m hoping the OST is available soon so I can play it in the background while I work in my office, but I’m not sure all of it is a great fit given the emphasis on battle. 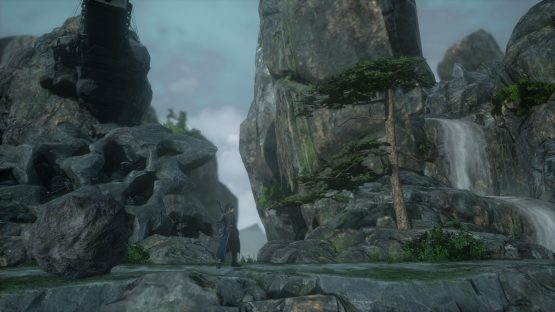 Overall, Hidden Dragon Legend is a middle-of-the-road effort: there are certainly a number of people out there who will be able to work through its less-than-polished mechanics long enough to enjoy the silly story, which is reminiscent of classic Chinese action cinema in the best possible ways. Then there will be folks who fall on the other side of the fence, without the patience to deal with the slightly clunky controls and dark, slightly muddied aesthetic. Either way, it’s nice to see more game development efforts coming from China, and—for me at least—the ability to play something focusing on Chinese culture actually created by the Chinese was more than enough reason for me to play through to the end. Hidden Dragon Legend review code provided by publisher. Reviewed on PlayStation 4 Pro. For more information on scoring, please read our Review Policy.